In 1986, Spectrasonics President Eric Persing was Chief Sound Designer for a very well-known Japanese manufacturer of digital instruments. Eric was closely involved with their development of an innovative rack mounted digital piano module called the MKS-20, that was not based on samples, but rather on a type of early additive re-synthesis called “Structured Adaptive®” or “SA” synthesis. This ground-breaking technology provided an extremely expressive response, compared to the limited sampling technology of that era. The MKS-20 design cleverly combined the digital side of the instrument with high-quality analog components and effects, resulting in a far warmer sound than most keyboards of the day. Velocity-triggered algorithms activated harmonic combinations which mimicked the naturally-occurring color changes of mechanical keyboards. Each of the 128 velocities had its own discrete color for each key, resulting in a highly expressive and organic sound. While the MKS-20’s Acoustic Piano simulations were soon eclipsed by rapidly improving sampling technology, there was always something very special about its unique sounding Electric Pianos, Electric Grand, and signature Vibes sounds. These sounds became an essential tool in the rack of every pro keyboardist, and were featured on literally hundreds of hit records throughout the 80s and 90s. Because it was absolutely ideal for “MIDI’ing” with FM synths, and other keyboards, everyone who could afford an MKS-20 had to have one! 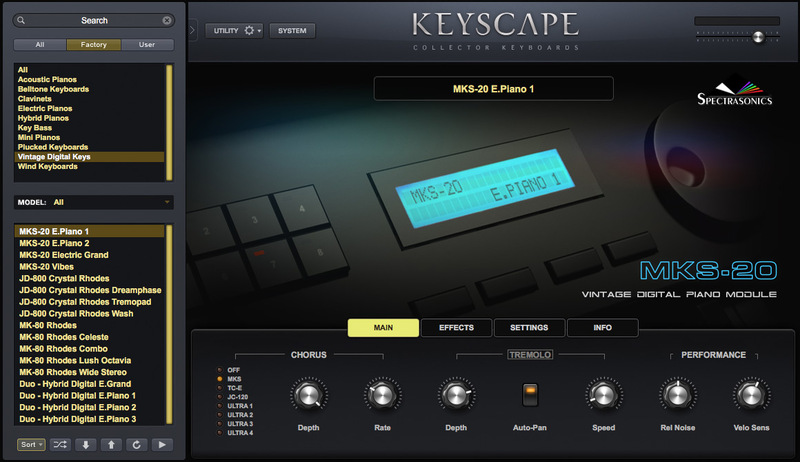 It’s with great joy that we can present the best of this “Vintage Digital” sound module in Keyscape! We’ve closely modeled its Analog Chorus/Tremolo FX and even added expressive release noises and lush reverb effects to bring it up to date!